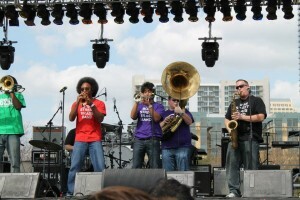 Boss Street Brass Band at the 2013 Urban Music Festival. Boss Street Brass Band will be making their first TCMF appearance this year. Come get your fill of funk on Sunday, April 21, at 1:30pm! Created in the Fall of 2011, most of the members are graduates from John H. Reagan High School in Austin, Texas where they where part of the world renowned Soul Raider Marching Band and Soul Train Drumline. The Boss Street Brass Band is a funky mix of New Orleans Funk and Jazz. Inspired by the Rebirth Brass Band, Hypnotic Brass Ensemble, Youngblood Brass Band and the Reagan High School’s NOFB, The Boss Street Brass Band will entertain you with high high energy and great party music to dance or just sit and groove to! Check out Boss Street’s Facebook page.